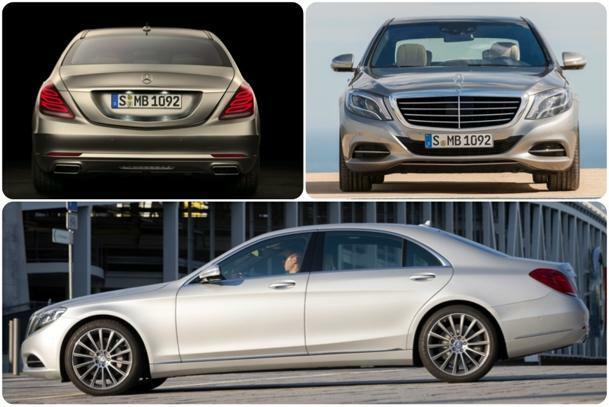 The 2014 Mercedes-Benz S550 can drive itself. This is not hyperbole, but an indubitable fact. Buy the new flagship sedan for an as-yet undisclosed price (we can’t imagine it returning many Sacagawea coins from a $100,000 bearer bond), tick the order boxes for the $4,500 Premium 1 Package and the $2,800 Driver Assistance Package, twist the key in the starter and slide the memory stick-sized column shifter into D, and sit back and relax. The car’s suite of stereoscopic cameras, radar sensors and ultrasonic gewgaws create what Mercedes — in a Snowden-level defection from Earth-bound physics — calls “6-D Vision.” This double-down dimensionality apparently endows the vehicle’s robot brain with an omnipotence once ascribed solely to God. Bow deep, luxury shopper. The automotive world has a new deity. All of these electronic systems create an eerie and unfamiliar dynamic, one in which the distinctions between being in the pilot’s seat and being a passenger disappear. Given the status afforded the S550’s passengers — who are all mollycoddled with heated, ventilated, reclining, massaging, perforated, diamond-stitched, perfume-shpritzed (! ), flatscreen-equipped, remote-controlled, Internet-enabled, mother-hugging, veal-soft leather seats, at least one of which (the right rear) can be made to prostrate toward a slumber-inducing horizontality — this is not meant as an insult. Still, in our years of test-driving vehicles, we have never before been confronted with the consistent desire, or ability, to remove ourselves from driving and turn around to speak to our passenger, who was splayed out in the aforementioned Diamond Class position like a resplendent Roman atop his villa’s stibadium. There are about 16,000 actions, previously left to the hands and feet and eyes of the driver, which the S550 can now perform with complete autonomy. These include starting, stopping, steering, braking, remaining in a lane, avoiding a head-on collision, avoiding a cross-traffic collision, fending off a rear-end collision, spotting street signs, reading street signs, spotting wildlife, parallel parking, right-angle parking, maintaining a safe following speed, spotting pedestrians, avoiding killing pedestrians and flashing the high beams at pedestrians spotted on the side of the roadway at night. We had the opportunity to experience and be awed by every one of these except the final one, as it is our feeling that whenever there is a pedestrian on the side of the road at night, he is up to something, and the last thing we want to do is call attention to the fact that we spotted him and highlight — with ten-zillion lumens of LED headlamp power — his act of burying whomever he’s just murdered and dismembered. Also, contrary to rumor, it is not possible to receive an upright MRI while positioned in the driver’s seat of the new S-Class. The exhaust does not bark, even if held to redline via the steering wheel’s paddle shifters in one of the transmission’s seven gears — instead releasing a maundering zephyric undertone, like that in a private jet or a Christopher Nolan film. The 18-inch standard wheels keep their rubber properly planted to any surface, via a quartet of shocks and continuously adjustable air springs, with an optional assist from MAGIC BODY CONTROL, which emits indomitable laser frequencies that seemingly pulverize into flowing silicone any proximate road imperfection. (For the flashy, 19-inch twin-spoke and 20-inch multi-spokes wheels are available, with concomitant all-season or performance tires, from AMG for $5,900 or $6,650 dollars.) And, of course, the entire structure is as rigid and inflexible as a filibustering lawmaker. And what a lovely structure it is. We personally felt that the outgoing S Class, the W221, had an uncouth appearance that was half bluster and half blather, with goofy cartoonish eyeballs and steroidal muscle bulges that put us more in mind of Mighty Mousen than a real Masters of the Universe. The new car, coded W222, smoothes out all of those crests, leaving a car that has an almost Italianate elegance without sacrificing any of the Teutonic purposefulness. The car is larger than its predecessor, but its refined cohesiveness, and the absence of overwrought “design” details that have plagued recent Benzes, make it appear more taut. If anything, the truncated trunk, while nicely integrated, might be a bit too small for a car of this scale. Or perhaps we were just operating under the swooning long decked influence of the 1980s W126 420 SEL Mercedes had on hand for chauffeur-driven comparison. We worship the W126. But while being ferried about in this car made us feel like a 1980s banker, driving — or should we say "driving" — the new S550 made us feel like we owned the bank. Or the bank owned us. Or we were inside an impenetrable vault in a bank controlled by our robotic avatar located in the sixth dimension and manipulated by proxy via a complex series of intergalactic shell corporations. Like the markets themselves, the S-Class excels at using technology to upgrade one's securities. That is a sick Benz to put it lightly! Just imagine pulling one of these sweeties behind a matching technological Newell Coach or any other luxury coach for that matter. I could envision myself setting my coach to auto-pilot and heading back to the bedroom while she cruises down the night highway making up time while I'm at rest. I know it sounds nuts right, but that day is nearing, the technology is already here, actually it's been here, the powers that be, just want to milk the currently used technology as long as they can or til' they think we can afford what can be. Nice I need to get me one of these. They say they will be introducing an AMG version at the Frankfurt Auto Show in September. You still have time to book a flight and check the baby out first hand. It would look good behind the Newell.